We are delighted to confirm that there will be an OGAE UK party this year for those not making the trip to Tel Aviv. 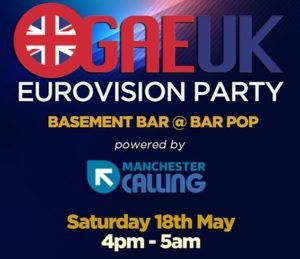 Organised by OGAE UK’s very own Jason D’Arcy – host of the ever-popular Manchester Calling shows – the fun takes place at Manchester’s Bar Pop from 4pm. Starting with a Meet & Mingle, there will be a European buffet, a screening of the contest and a cabaret with special guests and the all important Eurovision disco! Guests already announced include Lindsay Dracass and reforming especially for the occasion, the wonderful Belle & The Devotions! Tickets for this OGAE UK exclusive party are just £20 – ticket link coming soon. There are also a limited number of special VIP Meet & Greet tickets for £50 already available.